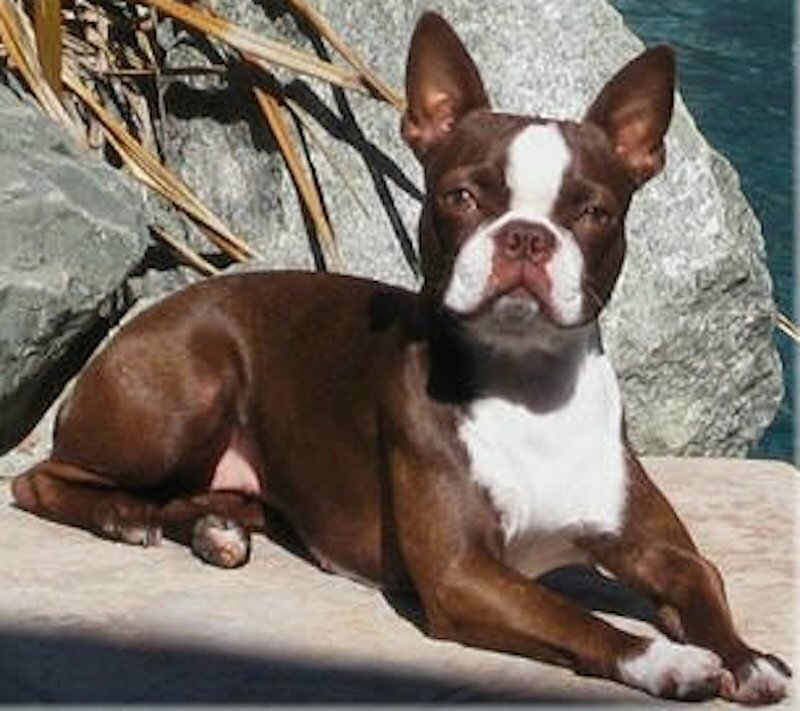 Boston Terrier is a friendly and lively dog breed noted for its excellent disposition and high degree of intelligence. 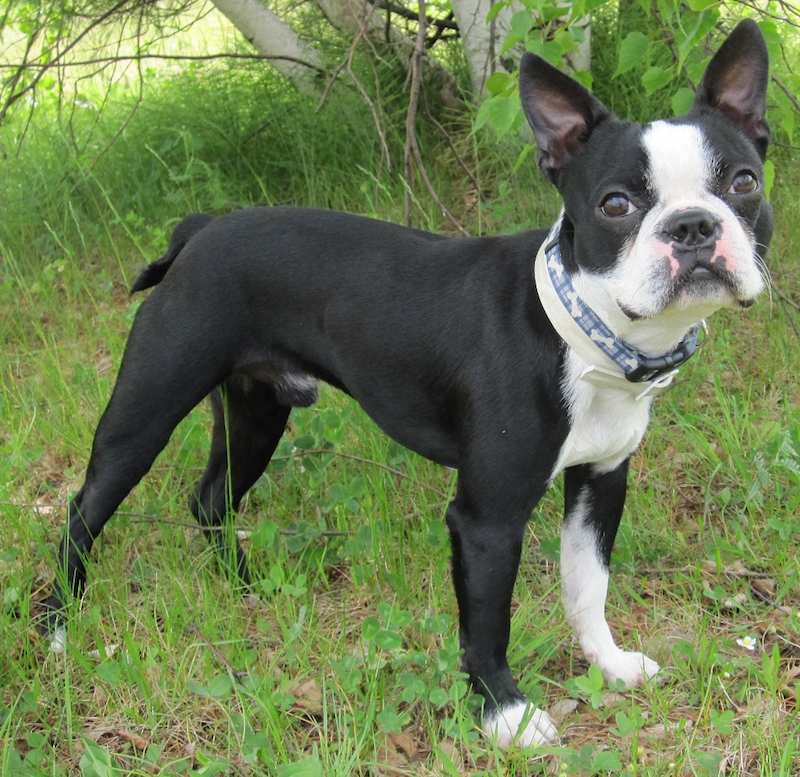 Boston Terrier has been nick named the Tuxedo Dog. 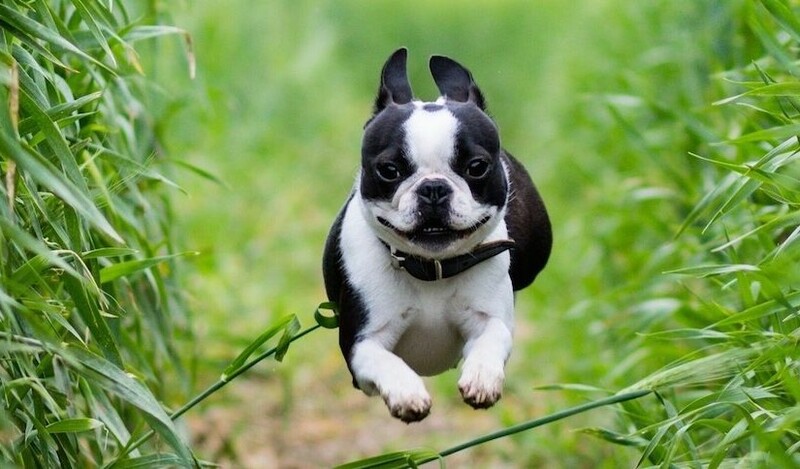 Early Boston Terriers were much heavier than the current canines but as the breed pared down in size, it gained in popularity and was the most popular breed in the U.S. between 1929 and 1935. 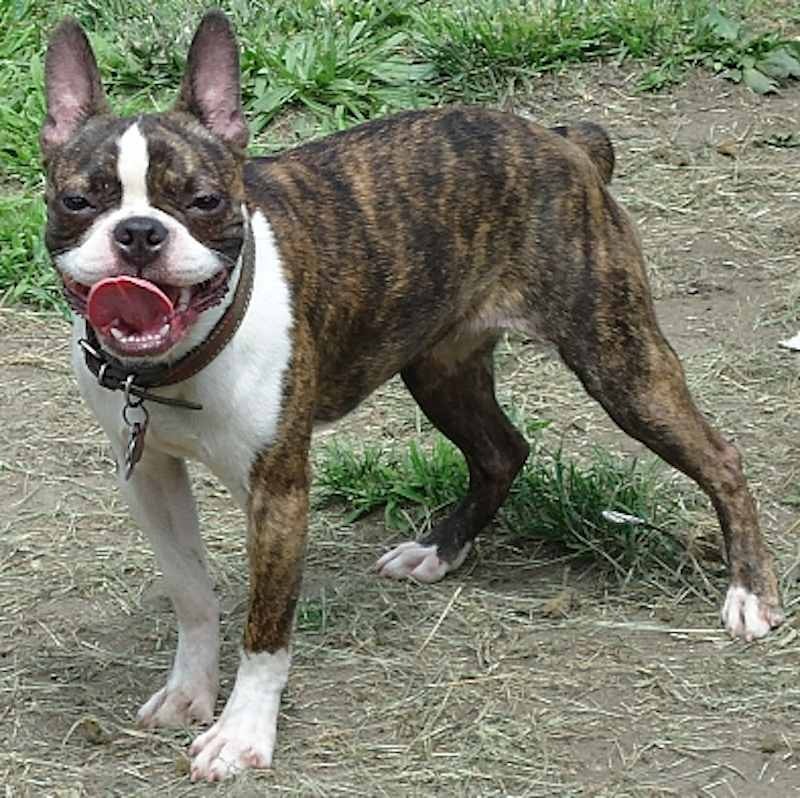 General Appearance: The general appearance of the Boston Terrier should be that of a lively, highly intelligent, smooth-coated, short-headed, compactly built, short tailed, well-balanced dog of medium station, of acceptable colour and evenly marked with white. The head should indicate a high degree of intelligence and should be in proportion to the size of the dog. The body rather short and well knit, the limbs strong and neatly turned; tail short; and no feature be so prominent that the dog appears badly proportioned. The dog should convey an impression of determination, strength and activity, with a style of a high order; carriage easy and graceful. A proportionate combination of colour and ideal markings is a particularly distinctive feature of a representative specimen, and a dog with a preponderance of white on body, or without the proper proportion of acceptable colour and white on head, should possess sufficient merit otherwise to counteract its deficiencies in these respects. 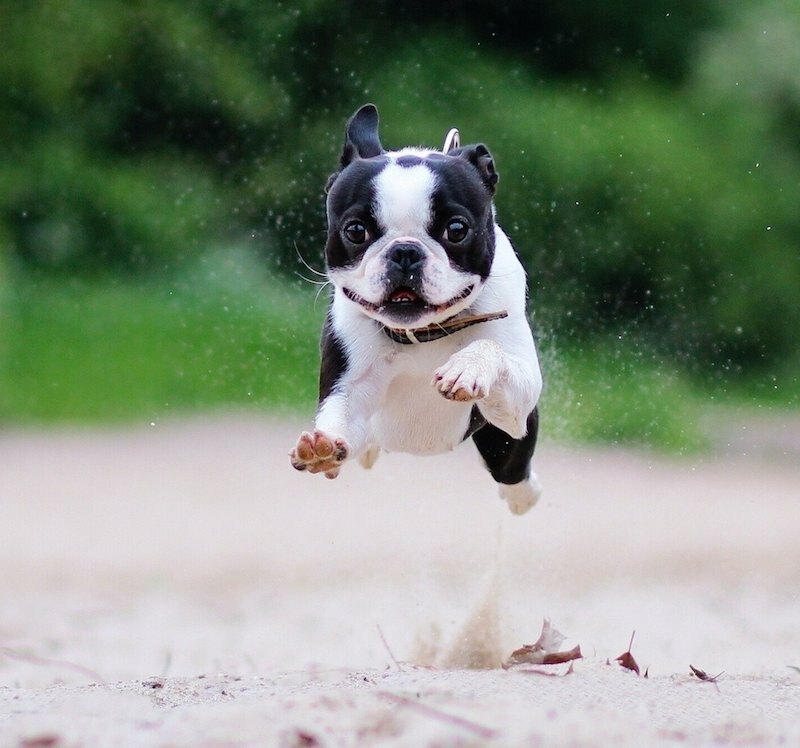 The ideal Boston Terrier expression displays a high degree of intelligence, and is an important characteristic of the breed. Colour and markings and expression should be given particular consideration in determining the relative value of general appearance to other points. Size: Not exceeding 25 lb. (11 kg), divided by classes as follows: lightweight, under 15 lb. (7 kg); middleweight, 15 lb and under 20 lb (7-9 kg); heavyweight, 20 lb. and not exceeding 25 lb. (9-11 kg). Coat: short, smooth, bright and fine in texture. 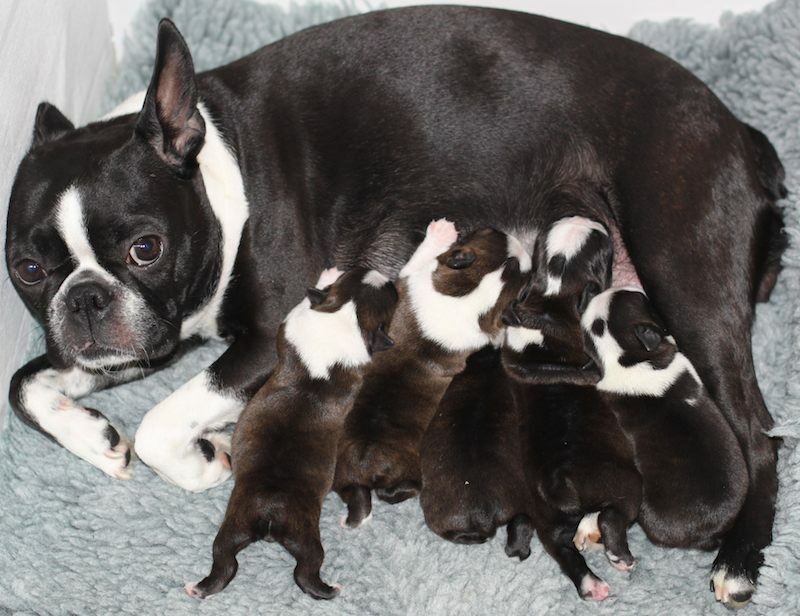 Boston Terrier Colours: Black, Seal, Black Brindle, Brindle, all with white markings. 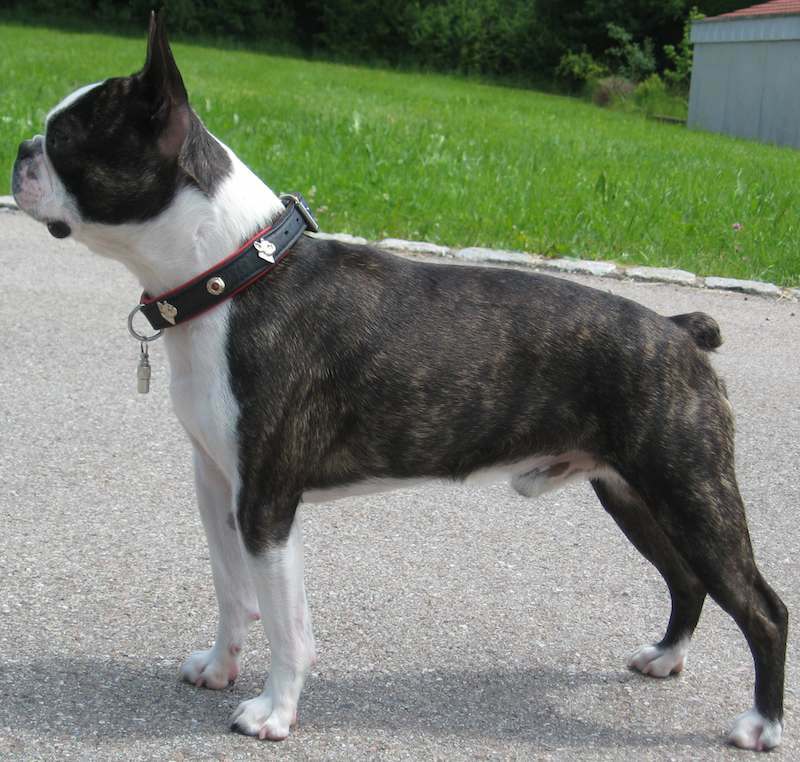 Brindle: Base colour being Brown with Black hairs distributed through the Brown. With white markings. All other colours are to be disqualified including any solid coloured Boston Terriers. Required: White muzzle band White blaze between the eyes. White fore chest. Desired Markings: White muzzle band. White blaze between the eyes and over the head. White fore chest Full or part white collar. Part or all of front legs white. White on the toes of rear feet Preferably not more than one third of the entire body should be white. Faults: Long or coarse coat; coat lacking lustre. Preponderance of white on body; without the proper proportion of accepted colour and white on head; or any variation detracting from the general appearance. Head: Skull square, flat on top, free from wrinkles; cheeks flat; brow abrupt, stop well defined. Muzzle short, square, wide and deep, and in proportion to skull; free from wrinkles; shorter in length than in width and depth, not exceeding in length approximately one-third of length of skull; width and depth carried out well to end; the muzzle from stop to end of nose on a line parallel to the top of the skull. Nose black and wide, with well-defined line between nostrils. Mouth: The jaws broad and square, with short regular teeth. Bite even or sufficiently undershot to square muzzle. The chops of good depth but not pendulous, completely covering the teeth when mouth is closed. Eyes wide apart, large and round, dark in colour, expression alert, but kind and intelligent. The eyes should be set square in the skull, and the outside corners should be on a line with the cheeks as viewed from the front. Ears carried erect, either cropped to conform the shape of the head, or natural bat, situated as near the corners of skull as possible. Faults: Skull domed or inclined; furrowed by a medial line; skull too long for breadth, or vice versa; stop too shallow; brow and skull too slanting Muzzle wedge-shaped or lacking depth; down-faced; too much cut out below the eyes; pinched or wide nostrils; butterfly nose; protruding teeth; weak lower jaw; showing turn-up, lay back; wrinkled. Eyes small or sunken; too prominent; light colour or walleye; showing too much white or haw. Ears poorly carried or in size out of proportion to head. Neck: Of fair length, slightly arched and carrying the head gracefully; setting neatly into shoulders. Faults: Ewe-necked; throatiness; short and thick. Forequarters: Shoulders sloping. Elbows standing neither in nor out. Forelegs set moderately wide apart and on a line with point of the shoulders; straight in bone and well muscled; pasterns short and strong. Faults: Loose shoulders or elbows; long or weak pasterns. Body: Deep with good width of chest; back short; ribs deep and well sprung, carried well back to loins; loins short and muscular; rump curving slightly to set-on of tail; flank very slightly cut up. The body should appear short but not chunky. Faults: Flat sides; narrow chest; long or slack loins; roach back; sway back; too much cut-up in flank. Hindquarters: Hind legs set true; bent at stifles; short from hocks to feet; hocks turning neither in nor out; thighs strong and well muscled. Feet round, small, and compact and turned neither in nor out; toes well arched. Faults: Hind legs too straight at stifles; hocks too prominent; splay feet. Tail: Set-on low; short, fine and tapering; straight or screw; devoid of fringe or coarse hair, and not carried above horizontal. Faults: A long or gaily carried tail; extremely gnarled or curled against body. The preferred tail should not exceed in length approximately one quarter the distance from set-on to hock. 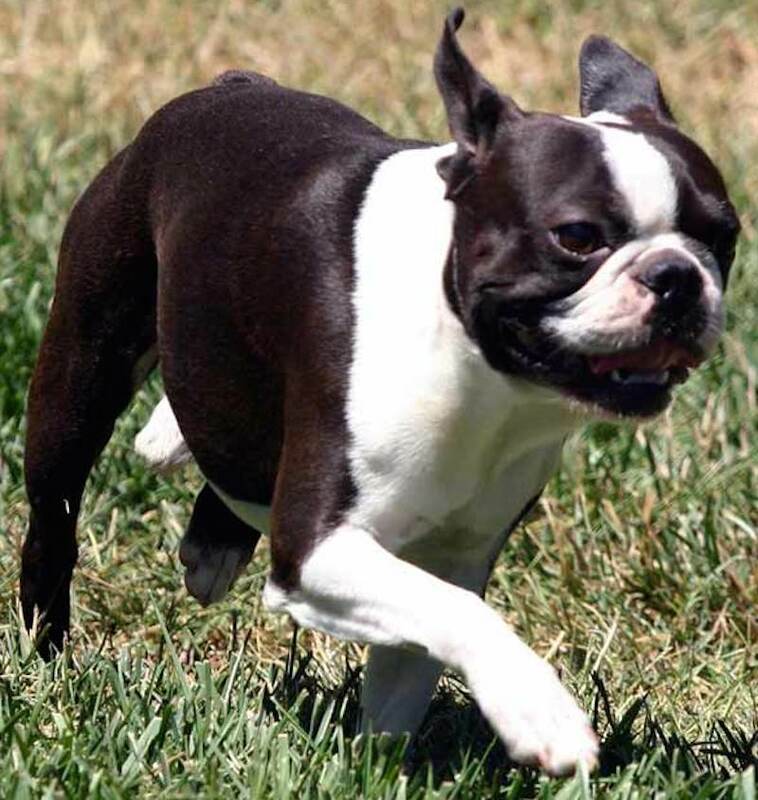 Gait: The gait of the Boston Terrier is that of a sure-footed straight-gaited dog, forelegs and hind legs moving straight ahead in line with perfect rhythm, each step indicating grace with power. Faults: There shall be no rolling, paddling, or weaving when gaited, and any crossing movement, either front or rear, is a serious fault. Disqualifications: Any Solid Colour; black and tan; red; mouse colours. All white, absence of white markings. Eyes blue in colour or any trace of blue. Docked tail. Dudley nose.